הגנה מפני חיבור סוללה לא מתאימה, אין טעינה כאשר מתח סוללה נמוך מ-2 וולט או גדול מ-15.5 וולט. Step1 Desulphation: Desulphation will pulse and revive sulphated batteries. Step2 Soft start: the charging current is limited for checking the situation and features of batteries. Step3 Bulk: main charging step provides most of current to speed up the charging. Step4 Absorption: terminal voltage maintains at original level and current drops after battery charged full. 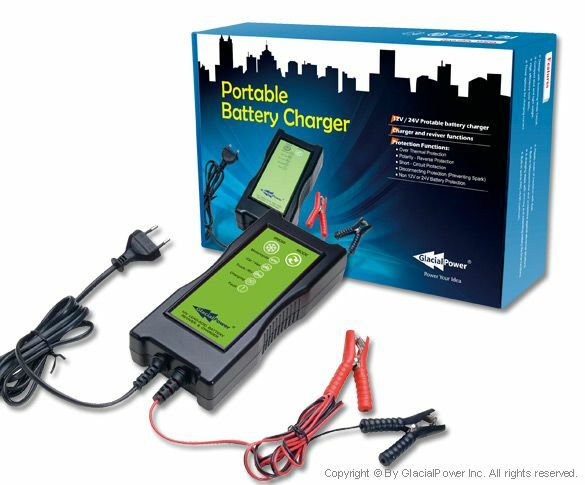 Step5 Analysis: charger tests the charging situation of charged batteries. Step6 Float: maintains a charged battery.